Getting our share of flooding and crawfish in Southern LA before chooglin’ on down to New Orleans, Louisiana. Our journey from the Great White North has opened our eyes to a lot of different landscapes but this was our first time venturing into full-on wetlands. 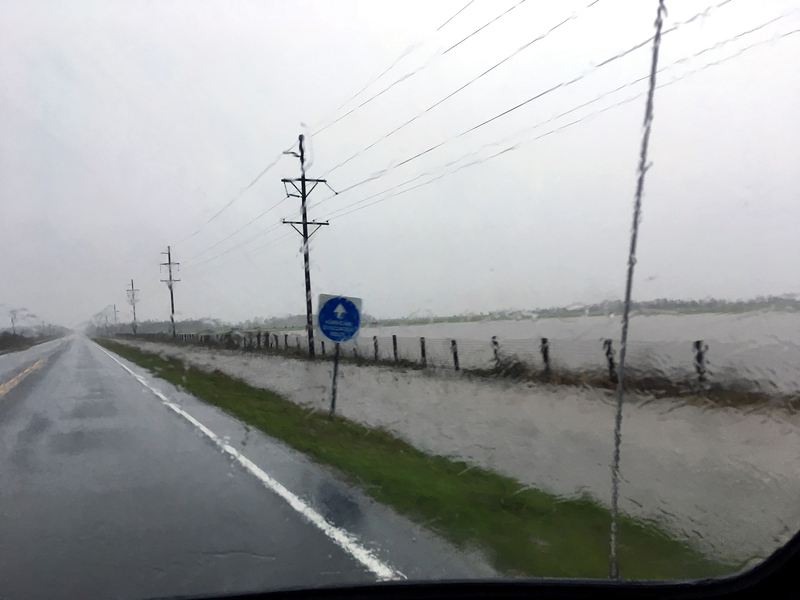 Louisiana was also such a good host and gave us the full experience by flooding on our first morning, causing everything to become a wetland. 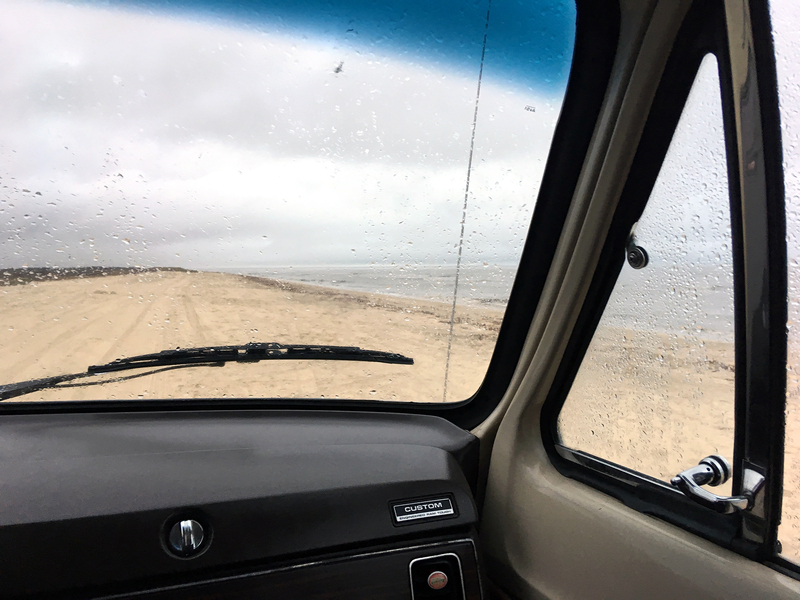 It all started when we set up for the night in a light rain at Rutherford Beach, south of the town of Creole. With only two fishermen on the beach, we had the whole stretch to choose where we were going to set up shop. We had been warned that the sand was very soft in areas so as expected, we got stuck. We were able to dig ourselves out fairly easily but it was comedic nonetheless. With our streak of grey weather, we were checking the forecast constantly in hopes of sunnier days. This time, we were promised a bit of rain in the night and a thunderstorm by early afternoon the next day – not great but no big deal. What actually happened was rain so heavy in night that I could barely sleep and waking up to flash flood warnings. We groggily started getting ready to move during a brief lull in the rain to avoid having to deal with mud-like sand if it got any worse. 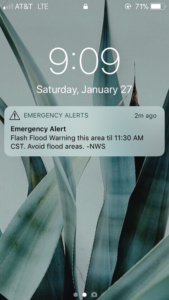 By the time we got back to paved road, we got emergency alerts from Apple so it seemed this was going to be more than a regular thunderstorm. Most of the roads weren’t too bad since they had banks alongside where water was pooling like it was its job. Keeping a slow pace, we sloshed around a bit but were happy to reach the Interstate that had much better drainage. Flash floods aren’t really things we’re used to dealing with so it was crazy to see peoples’ front yards as ponds instead of grass. Of course this wasn’t a flood of much grandeur but people living in these areas must just have to get used to it. I guess they’d be equally as shocked if they saw how our houses get half covered in snow and we barely bat an eye. Being such a gross day, it was a good opportunity to run some errands around the Lafayette area and catch up on a couple home projects. The main one being replacing our sink faucet since our old one (probably the original) kept breaking and then started to leak. Thinking about modernizing and bringing ourselves into the 21st century, we browsed for some electric pumps to have normal water flow but were discouraged by how powerful even the weakest ones were – if 2.5 gallons of water could be pushed through our plumbing in a minute then probably burst. We stuck with a new version of what we had before, a manual hand pump. It’s not ideal when you want to give your hands a good scrub or rinse out a sponge but it does the trick and saves a lot of water. Maybe we’ll look into getting a fish tank pump to give us that gentle flow we need. Any suggestions? 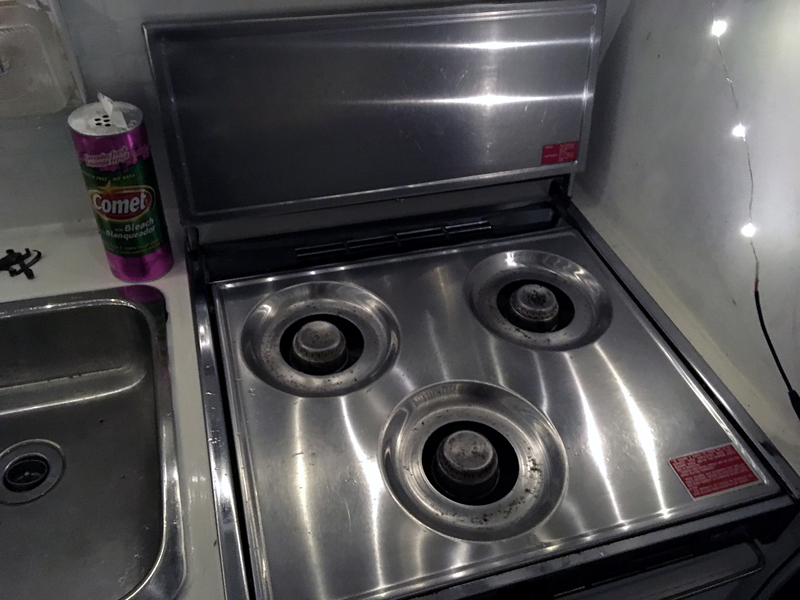 Rainy days = time to clean 30 years of grease off the stove! Look at that sparkle! When the rain finally subsided, we ended our day at the Atchafalaya Welcome Centre between Lafayette and Baton Rouge. Beyond just being a free, safe spot to sleep for the night, the welcome centre boasts free coffee, lots of helpful tourist info and even a little museum of sorts all about Cajun culture and heritage. The ladies that worked there were total sweethearts and were eager to give us some good food recommendations and of course, speak French! I went to French school and even studied Franco-Caribbean literature (don’t ask) so I’m quite familiar with Creole and was disappointed to hear that learning French isn’t part of regular schooling anymore. Although, it’s not surprising since Spanish is evidently much more prevalent in the US. Anyway, we popped in the next morning to grab another cup of that sweet java and a different lady at the desk insisted that we get some authentic Cajun food before heading to New Orleans. 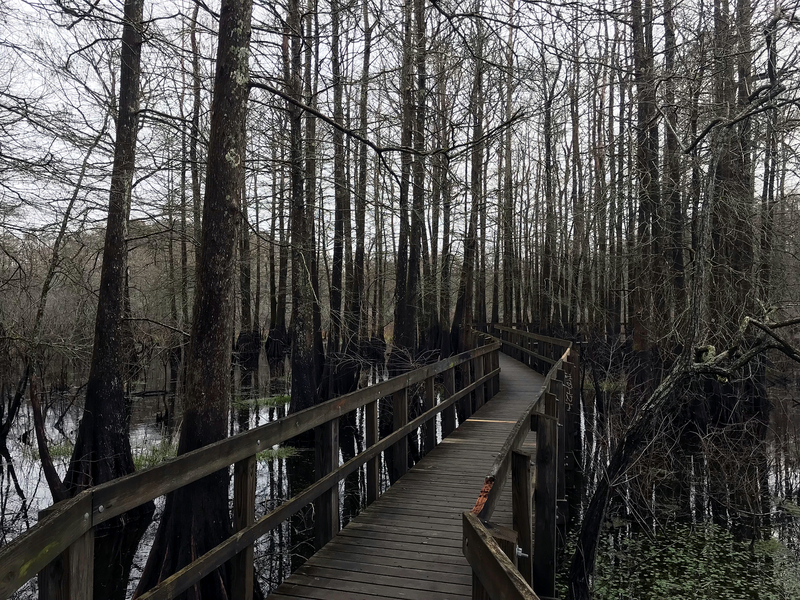 She directed us to Lake Martin in Breaux Bridge to check out some of the real deal swamps and maybe even see an alligator. Believe me, we looked for them but those fellas are so good at blending in that we didn’t see any. 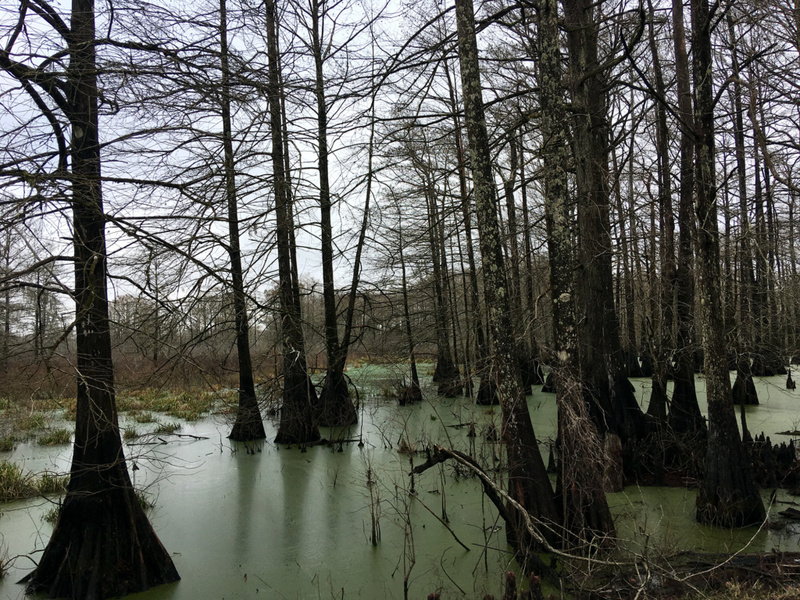 In any case, the area was super cool and home to so many interesting birds and other wildlife that rely on the disappearing wetland areas to survive. After driving on the stretch of the I-10 that is basically one big bridge over a swamp, it was interesting to walk on the boardwalk and see the green waters up-close. We didn’t do a swamp tour but perhaps we would have been more successful with gator patrol had we done one. Next time! After the swamp, we went to a small café called Chez Jacqueline, run by a French lady cooking up tasty Cajun food. As per the welcome centre lady’s recommendation, I tried the crawfish bisque and it was ridiculously good. Like better than I would have ever expected. We’d never tried crawfish before so were shocked by how much texture it had before just melting in your mouth. Everything we ate was delicious, probably because as Jacqueline insisted, always use butter and never margarine. As any tourist in Louisiana does, we made our way to New Orleans. We managed to find a parking lot in the French Quarter that has a $50 RV rate so you can sleep in your car. It’s good for 24 hours so you’re free to roam around a bunch and be comfortably hungover the next day since you’re not in a rush to check out by 11AM and face the judgment of a hotel front desk person. The first thing we noticed were the somewhat gaudy cemeteries with large concrete tombs similar to those that I’ve seen in France. 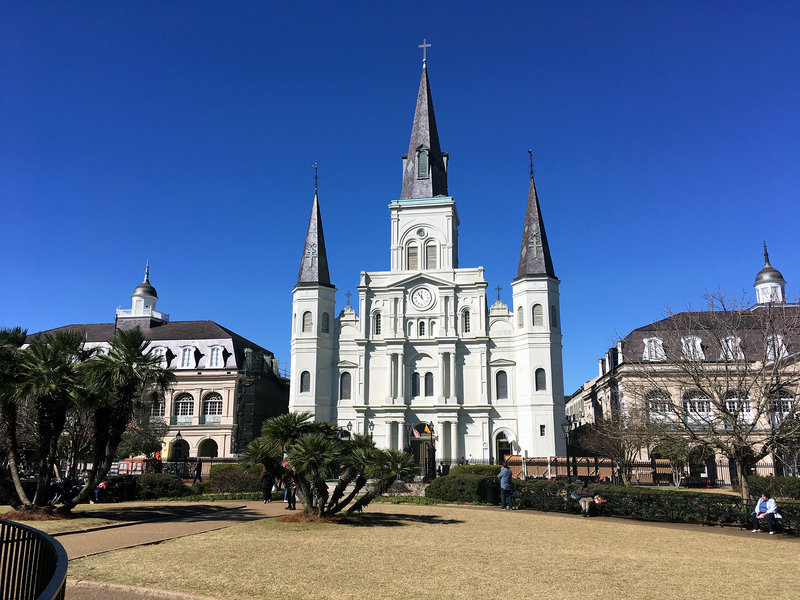 These seemed to show their age a bit more than those of Père Lachaise but still set the tone for the European influence on the architecture and style of the city – or, the French Quarter at least. 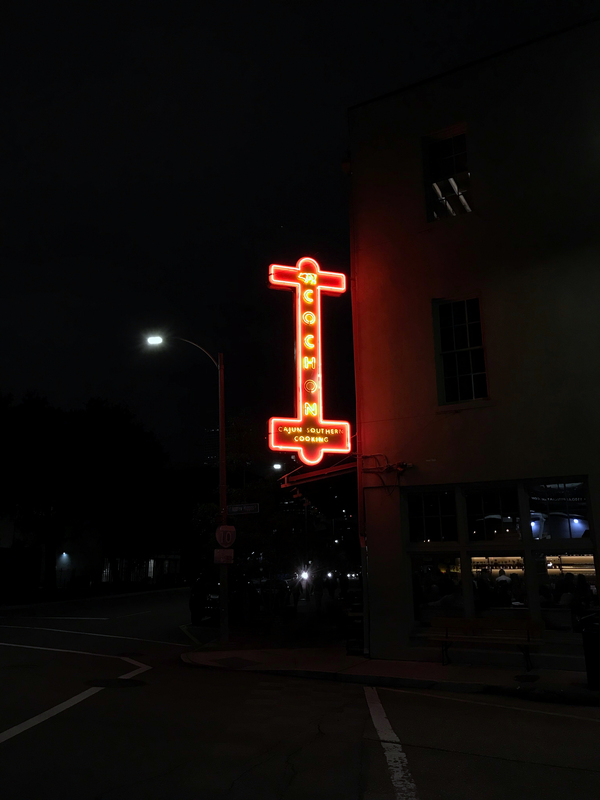 We walked around and explored a bit before having dinner at Cochon in the Lower Garden District on a street with a name so long I’ll probably exceed my character limit. We heard it gets quite busy and we’re not big fans of waiting in lines so we were prepared to have to go somewhere else (can anyone say Emeril Lagasse’s restaurant down the street?!? Sarcasm.) but we seemed to get there right as a two-top was leaving so we were able to snag a spot in no time. It’s hard for me to even articulate how delicious everything was. It’s a very pork-centric menu (yum) with roots in Southern comfort food. We had the gator, the rabbit & dumplings and pork ribs with pickled watermelon and it was the best I’ve ever had in each category. Prior to this, I didn’t even think I liked gator since I’d only had botched probably Sysco-supplied bites, but I could have eaten these bites by the dozen. From the delicious cocktails to the impressive whiskey list, we cannot recommend this place enough. Without turning this into an unwarranted Yelp review, we’ll just leave it as a must-visit if you’re ever in New Orleans. Obligatorily (very surprised that’s actually a word), we did the Bourbon street crawl and admired and cringed at the same time. This was the weekend before Mardi Gras kicked off so the bars were treating it as a calm before the storm but that sure didn’t stop people from decking themselves out in beads and slamming back slushy daiquiris. 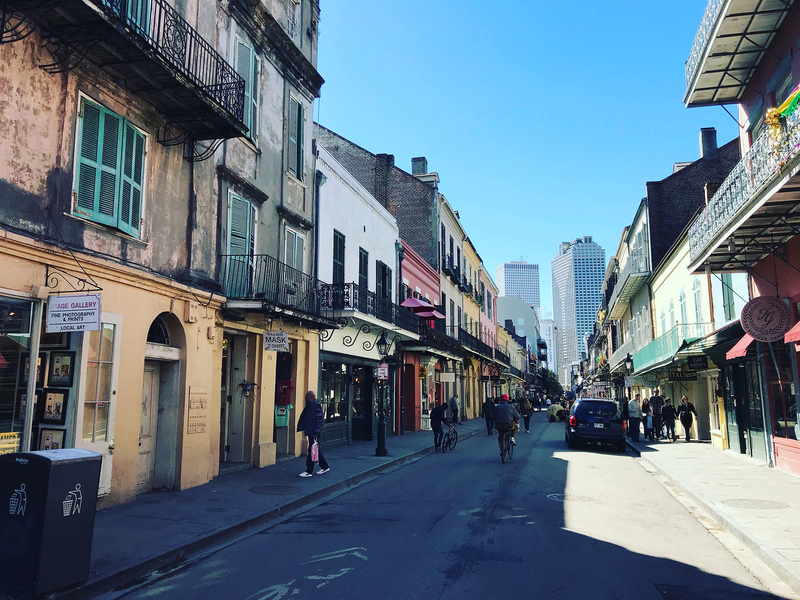 NOLA has obviously earned its stripes as a party city but it wasn’t really our scene. As similar to Vegas as it was, there was a clear distinction that I can’t quite put my finger on aside from it being a bit overkill and a bit less tacky-on-purpose. In any case, we had a good time checking out some other bars on the outskirts before eventually retiring to our lovely parking lot hotel. Not only did this parking lot provide accommodation, but there was also no shortage of entertainment. Shortly after we returned, a couple of guys got into a fight directly beside the van before renewing their ultimate bromance by telling each other they’re the bestest friends they could ask for and everyone lived happily ever after. With our minds at ease knowing that these guys are forever buds, we passed out and were abruptly awoken by the loudest Christian music around 4 AM. It was way too loud to be coming from a car and sounded like it was coming from a PA system or even a live concert that magically began and completely shut down when the song was over. We have no clue where it came from or what it was all about and we’re just gonna continue to leave it that way. We got ourselves up in the morning to see how it all looked in the daytime and enjoy a beignet (or three) at Café du Monde. It was lovely to have breakfast outside while jazzy musicians played some tunes and tourists emerged from every crevice of the city. 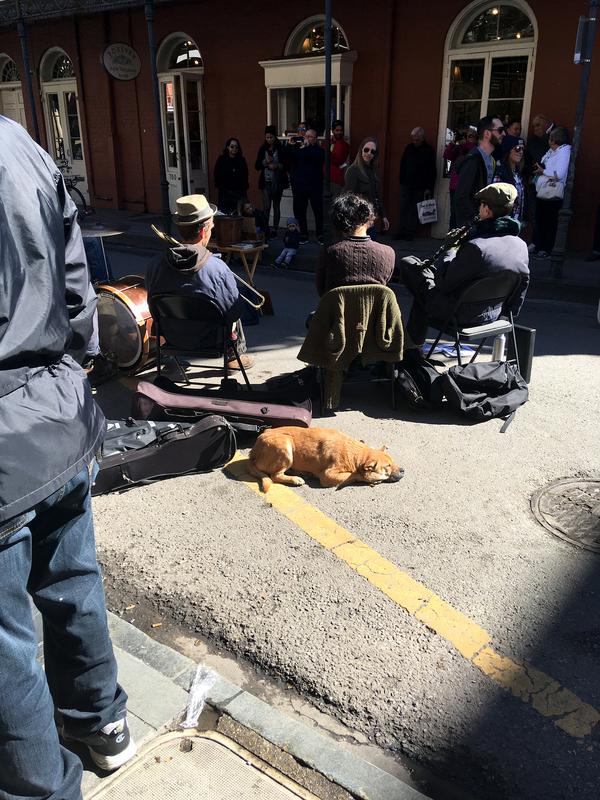 We walked through Jackson Square and around a bunch of small streets with musicians set up and countless crews of people doing repairs on buildings to prepare for the madness that is Mardi Gras. 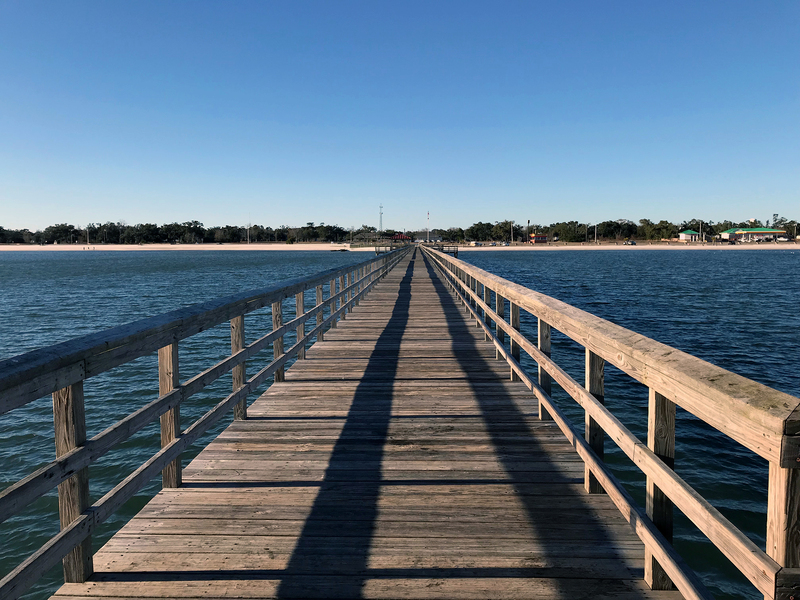 After skipping town, we continued along the Gulf Coast, taking the scenic highway 90, and were blown away by how pristine and pretty the coast of Mississippi is. White sandy beaches and plantation-style homes with mature trees lined the highway the whole way until Biloxi’s hotels and casinos hit. We had no idea that this vacation destination existed but we’ve clearly been left in the dark because it even had a Golden Nugget! I’m not sure that that’s a unit of measurement per se, but let’s just leave it at Biloxi being a bigger city than we thought. There’s clearly a lot of money in this zone so we can see why it would attract people wanting luxurious vacations that they can’t get in other parts of Mississippi. We stayed the work week in Gautier in a more forest-y area that was generally pretty quiet until there was a police chase on our last night. No clue what was going on but I’d like to think it was juicy. Maybe I watch too much TV. After Mississippi came the blink of an eye stretch that was Alabama. We decided to get groceries in Mobile just so we could say we spent more than 40 minutes in the state. We ended up talking to a guy in a Starbucks parking lot as we were stealing wifi who told us that Mardi Gras actually originated in Mobile and not New Orleans, despite their ubiquitous association with it. CNN fact checked this and it’s apparently true so there’s a good trivia question for ya. In addition to enlightening us about Mardi Gras, we also learned that it’s pronounced mo-beel and not mo-bull like we had been saying it. In our memories, Mobile will just be full of fun facts! Anyway, these were all just rest stops as we make our way to the east coast of Florida to watch the Falcon Heavy Launch. Something we both never thought we’d be able to do so living the van life definitely has its perks!